I hope you all had a great week and are ready for the weekend! Depending on where you work, you may have a dress down day, which will most likely be on a Friday. On days like this, you want to aim for an outfit that's both casual and comfortable, yet still professional and the easiest way to do achieve this is to add a blazer. You may have noticed that I tend to add one to simple tops and tanks because it really helps to add a dressier and more polished touch to an outfit. 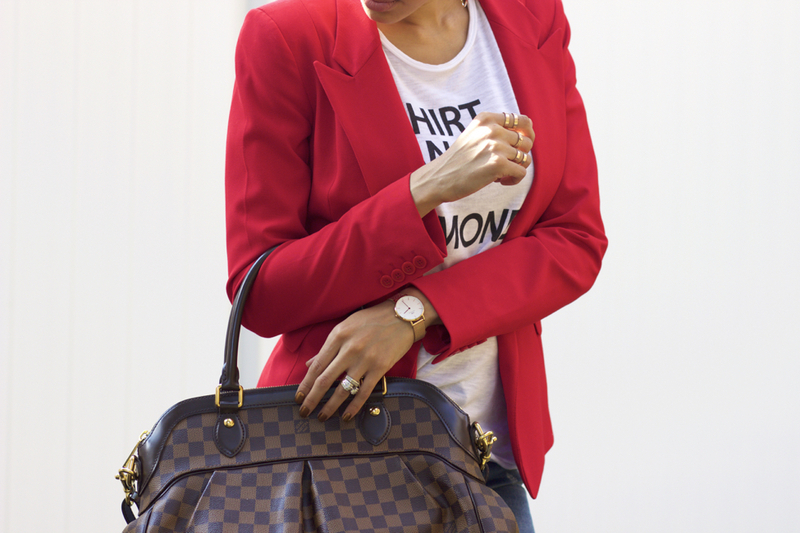 Today, I've toped my slogan tee with a blazer and paired them with distressed skinny jeans. I know that not every job that has a dress down day will permit for one to wear distressed denim and in that case, you can still opt for skinny jeans minus the distressed details. Skinny jeans have a tapered effect on the leg, making them the most dressier style of denim to work with. When the hems flare out, I think it can further enhance the casual feel, but this is totally my opinion not a fact. When it comes to shoes, I'd suggest a pair of pointed toes, either flats or pumps, you want to be practical for what your job entails, which is dependent on whether or not you're on your feet all day (flats) or at a desk (pumps). Do YOU have a dress down day at work? If so, do you have an outfit formula you tend to turn to on those days?